This page covers SERDES basics, SERDES architecture types and SERDES IP Core developer or provider. SERDES is the short form of Serializer/Deserializer modules used for high speed communication link. As shown in the figure-1, both the ends of high speed link such as fiber optic or ethernet link uses SERDES device. 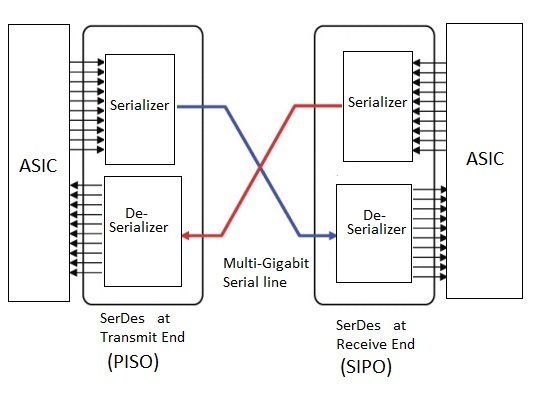 SERDES has two functional modules PISO(parallel in serial out) and SIPO(serial in parallel out). As depicted it is basically a transceiver which converts parallel data to serial data, processes at very high speeds and then connect it back to parallel interface at the other end. There are several advantages of SERDES such as it enables transmission of huge amount of data over single or differential line which helps reduce number of data paths as well as number of pins. This reduces complexity, cost, power and space on the PCB. Following are the companies offering SERDES IP Cores.